And to help get you in the spirit, here's Rocky Top!!!!!!!!! Classic Doctor Who rarely delved into the emotional lives of the companions and the impact that traveling through time with the Doctor had on them. (The NAs started this, though their take that every companion was somehow permanently stunted by traveling with the Doctor got a bit old after a while). The new series, especially under the direction of Steven Moffat has delved a bit more into this and, for the most part, the results have been pretty solid. And then they go and hit you out of left field with something like this episode. I have to be honest--based on the preview I wasn't expecting much. So, I was surprised about halfway through the story when I found myself completely caught up in what was happening. Amy's waited for the Doctor all her life. It's part of her story (and to a lesser extent, it's part of Rory's as well). She waited for him to come back all growing up and here she's forced to wait for him to come back and rescue her again.....a wait that takes almost 36 years. Give Karen Gillan credit for pulling off the two versions of Amy and doing it well. What we saw here with the older, much more bitter Amy was some of her best work in the show. Could it be that the fact that she lost not only much of her childhood, but also her daughter's childhood and is then forced to survive alone as she awaits the Doctor's rescue has finally pushed her over the edge? This sequence, coupled with the fact that the Doctor lies to all of them about being able to save both Amys leads me to suspect somehow the older, bitter Amy could be in the space suit. The episode, written by Tom DeRae, did just about everything right. It should be interesting to see what, if any, impact these events have on the bigger questions lingering over the final run of episodes this season. Over the past season, I've been predicting that the IRS would enter the picture at some point and, quite possibly be the way in which Walt is brought down. And it appears that is coming to fruition with the IRS sniffing around Ted Beneke's finances. And since Skylar's name is all over those books, it's only a matter of time before they start looking into her financial situation--especially if she does what I am afraid she might do and pays off Ted's IRS debt. As we've seen all season, Skylar is comfortable on the surface with Walt being a high power criminal player. But when reality rears its ugly head, she isn't quite as comfortable with things and she, like Walt, scrambles to find a solution of whatever corner she's painted into for the moment without thinking how it will impact things long term. Speaking of Walt, watching the last two episodes, I couldn't help but wonder if the show is trying to create some parallels between Walt and Gus. Both men entered into the world of producing meth with certain naive ideas of how things would unfold, only to see reality smack them firmly in the face. The one big difference between the two (so far) is that Gus seems less reactionary that Walt. Walt wants immediate revenge or satisfaction. Gus seems to have a long term vision for how to enact his revenge or how to take advantage of the opportunities as they arise. The final scene last week when he tormented Tio summed that up fairly well. This week, however, it looks like Gus may be losing some of the control he's worked so hard to create. He's giving in to the Cartel's demands for the blue-meth formula (possibly to take the heat off him from Hank?) and he seems to be ready to cut Walt out of the picture. I wonder if someone close to Walt will die before season's end in much the same way Gus' original partner did in the flashback? In between these two is Jesse, who is conflicted in his loyalties. Both Gus and Walt are offering bits of what he needs most, but neither offers it enough to help him make a decision. The fight between Gus and Walt was a long time coming and whether it signals a permanent rift between the two remains to be seen. Could we see Walt betrayed by Jesse? Or even Jesse using the poison Walt has created against him? Let's go drain the swamp! And to help get you in the mood for Saturday's clash in the swamp, here's one of my favorite bluegrass groups playing Rocky Top!!!!!!!!! For the first time since 2006, the Vols are 2-0. It's made even better based on what I saw on the field yesterday. Three huge plays in the game went Tennessee's way. Plays were made and momentum squarely came to reside on our sideline. I love the on-side kick-off call by Dooley and I love how our defense settled in and stopped two fourth-and-one attempts by the Bearcats. And they weren't even close to being made. Add in that Cincinnati got the ball first and goal from the one and couldn't score on three straight plays late in the game and I feel as though our defense made the necessary step from game one to game two. Offensively, it looks like we're going to depend on the pass to set up the run. Our run game started out slow, but wore down their defense. Whether that can continue once we get into SEC play remains to be seen. I doubt a defense like LSU would wear down over time like the Bearcats did yesterday. I'm savoring the moment. Tomorrow we can look ahead to a showdown in the Swamp. The test gets a bit more difficult this week, but I think the Vols can do it. Provided we clean up some mistakes from last week, improve our running game and make some big improvements on the offensive line! Forty-five years ago today, those immortal words were first heard by the American viewing audience. I wasn't alive when classic Star Trek first began airing, but I've been aware of it for a lot of my life. A lot of this is thanks to the motion picture franchise. Ads for Star Trek: The Motion Picture were plastered all across several comic books I had growing up and I recall begging my mom to take me to see it when it arrived at the base theater in Hawaii. Being a Star Wars fan, I had visions of the movie being something similar...yeah, not so much. But it still inspired something in me to explore more. I collected a series of Power Records that featured original adventures of the Enterprise crew and really liked those. I remember visiting my grandparents in Memphis one summer around this time and seeing that Star Trek was on TV that night. Again, I begged my mom to watch and she eventually let me, though we had to tune out early. It's a love I hope to share someday if I'm blessed with kids or with my niece and nephew. Odds are my nephew could enjoy Star Trek since he already has a love of Star Wars. Years later, I still love classic Star Trek. The original 79 episodes aren't all perfect, but there's something to like about just about all of them. In many ways, Star Trek was my first big franchise love. Classic Trek is my second favorite TV show of all-time, coming in just behind Doctor Who. And it all began forty-five years ago tonight. With "The Man Trap." Yeah, not exactly a top ten classic, but still a solid introduction to the universe. And while I understand that there are some who love the new effects, I'm still not entirely sold. I love how incredible the re-mastering has made the original series look again--so vibrant and colorful. I'm seeing things I'd missed for years on UHF stations and VHS tapes. But I'm glad the Blu-Rays let me toggle between updated effects and the originals. If the new effects bring in new fans, who discover why I love this series so much, so be it. Hopefully they see the great stories, the Kirk/Spock/McCoy dynamic and all the other little things that make Trek among the greatest tv shows ever made. Retro TV Round-Up: Star Trek: "The Enemy Within"
"The Enemy Within" is the first time in the classic series run (both in air order and production order) that we see duplicate versions of some of our familiar characters. (Interestingly, we'll get a copy of Kirk made in just two more episodes). But of all the copies of various character stories that original series created, this one may be the most interesting from a character stand-point. Oh sure, it's fun to see evil mirror images of the familiar cast and crew in season two, but "The Enemy Within" explores something a bit deeper and more fundamental--what it takes to be a leader and how we need both the positive and negative aspects of our psyche in order to fully function in the world. The script is by Richard Matheson, who penned a lot of Twilight Zone episodes as well as some great books and short stories. Interestingly, he penned the classic Zone episode "Terror at 20,000 Feet." Both stories gave William Shatner a lot of scenery to chew, though I'd argue that his work here in "Within" is a bit stronger and more scenery chewing. As with many of Matheson's other stories, the exact scientific explanation for how some bizarre situation has come to be isn't the important thing (in this case, it's simply that some yellow dust throws a monkey wrench into the transporter), it's exploring the impact it has on an "everyman" type of character. In this case, that everyman is Captain James T. Kirk who through a transporter malfunction is split into to two halves--one half that is the positive half and the other a negative one. The first quarter of the episode sees both Kirks roaming the ship, each blissfully unaware the other exists and acting as befits the series of traits each is given. Good Kirk has the compassion and intelligence though he lacks the fire of making a command decision. Dark Kirk is pretty much a horndog, who is ruled by any impulse that comes to him and has virtually no patience or restraint. But for all that, he still has some shame, given that each time he acts on his instinct and it doesn't go well, he retreats and wants to hide from potential punishment. Eventually, Scotty realizes the transporter has an issue and they have to shut the whole thing down. This creates an additional tension of stranding a landing party on the surface of the planet with the temperature rapidly plummeting. (The episode was filmed fourth and the only thing I can think of is they hadn't decided to include shuttlecraft at this stage of the game. Either that or it makes it too easy a dilemma for Kirk). 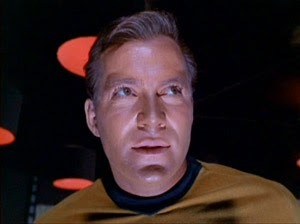 As the good Kirk struggles with the decision on what to do, dark Kirk has no qualms. At one point, he knocks out good Kirk and then heads to the bridge, deciding that he'll abandon the landing party and move on. (This comes late in the episode and helps serve as a clue to the crew that things aren't on the up and up). As I said, it's a fascinating examination of leadership and the qualities that make a good leader. I'd seen the episode multiple times before I headed out to UT for freshman English and for one of my first papers, I compared what we see here with Kirk to arguments made in "The Prince." Especially of interest were the comments by Spock that Kirk didn't have the luxury of appearing weak to the crew or letting it slip that he's human. I ended up getting an A on the paper and doing such a good job that I set the bar really high for all other output that semester. But that's not the only reason I have a fondness for this episode. Another is that during the 25th anniversary of the show, I convinced multiple friends on several occasions to ride into Washington DC with me for the 25th Anniversary Star Trek exhibit at the Air and Space Museum. To say I ate this exhibit up with a spoon is an understatement. And while seeing props from the show, models of the ships and reading about the impact Trek has had and how it reflected the times it aired, one of the most fascinating parts of the exhibit was an original script for this episode. The script had Matheson's original dialogue for the pivotal scene where McCoy and Spock debate what's happened to Kirk, with much of it crossed out and the familiar dialogue from the episode penciled in. Both of those aspects just add to the cool factor of this episode for me. Not that it's a perfect one, mind you. If you watch closely, you can see how certain scenes were moved around in editing (mostly in the first act...watch the scenes with the duplicate dog and the transporter). Also, the third act drags a bit. Once we recapture dark Kirk, a lot of time is spent wondering if and when Scotty will fix things (dark Kirk manages to fire a phaser into a vital circuit board when captured). Of course, we know the show won't let the landing party die and we know Kirk has to be restored to his usual self by episode's end. It's almost like a four-part Doctor Who story in which little happens to advance the plot in the third episode. That said, it's still a solid, entertaining and fascinating episode. It's also historic in that it features the first use of the Vulcan nerve pinch. While I enjoy much of what the new series of Doctor Who has to offer, it's still nice every once in a while to have a story like "Night Terrors" that feels like it could easily slip into just about any season of the classic run without too much difficulty. Mark Gattis' script is a fairly straight-forward one, dealing with a child who is terrified of being alone in the dark of his bedroom. His parents, trying to help him deal with his fears, have "locked" the fears all up in his bedroom cupboard. But the plan hasn't soothed Gordon who is ably to psychically summon the Doctor to help him confront the monsters that lurk there. Surreal stories have had their place in Doctor Who since the early 60's ("The Celestial Toymaker," "The Mind Robber" "The Greatest Show in the Galaxy") and it's nice to see the new series embrace that a bit here. Watching the story, I predicted where Amy and Rory were long before they put it all together, but that still didn't make the story any less entertaining or interesting. I was happy that the story made Gordon's fear something as "simple" as a child wanting to be sure his parents loved him and wouldn't send him away instead of something a bit more sinister. Visually, the story was a treat with lots of dark corners, shadows and the image of people being turned into living dolls probably scaring or frightening more than one younger viewer. (It certainly unsettled this much older viewer). It's easy to imagine that if this story were made during the Gothic-heyday of the Tom Baker/Phillip Hincliffe/Robert Holmes era that a certain leading critic would be up in arms about the unsettling nature of things on the screen. That puts "Night Terrors" in some solid company among stories that are the best in the entire run of Doctor Who. While not quite as much of a treat as "The Doctor's Wife," "Night Terrors" is still among the better stories from the current series. It reminds of just how creepy Doctor Who can be when it wants to be. Sometimes it's easy to forget how much I love football....and then the first Tennessee game of the year kicks-off and I remember. Thankfully, the Vols made the outcome certain early in the game with a couple of huge plays in the first quarter. The passing game on big plays looked good and we converted several third and shorts and fourth and shorts during the game (a glaring weakness last year) . And the defense looked disciplined at times, pursuing the ball and making some solid stops and good tackles. Now for the not so good. Our offensive line, reportedly one of the big strengths of the team, didn't push anyone around enough and our running game was anemic. The stats for the game running make it look OK, but overall things really didn't get rolling until the fourth quarter. It could be that Montana is a team with more upperclassmen playing or it could be that we still need a lot of work here. If I'm a coach at Cincinnati and Florida, I immediately game plan to shut down the big play passes and make the running game and Tyler Bray's shorter passing game beat them. But let's not overlook that the Vols won the game and started off the season on a solid note. It's great to have football back! What was once a show exclusively about Walt has, in many cases, made Walt almost a supporting character this year. Walt is still fascinating to watch, but what's really interesting is how compelling all the supporting characters have become over the past several years. First and foremost is Jesse, who this week agrees to help Walt take out Gus. Or does he? Watching the episode, I couldn't help but wonder if Walt's asking Jesse to kill Gus won't lead to a betrayal of some kind. All season, Gus has been working to split up the team of Walt and Jesse, driving a wedge between them. As Vince Gilligan has said, this season is a chess match between Walt and Gus. If so, what piece is Jesse? Or what piece is he to each player of the game? I think he's more than just a simple pawn the two push around...maybe more like a bishop or a knight. (I'm not as strong in my chess playing ability as I should be, so I could be way off base here). But now with Jesse having the poison to take out Gus, any scene in which Gus and Jesse appears becomes tension filled. Will Jesse follow through? Can he handle the guilt from killing another human being? It's interesting to see how little Walt agonizes over the deaths he's caused over the years and how much Jesse does. The scene with Jesse playing the video game as he tries to confront what he's done to Gale was nicely done. Next up, there's Skylar, who while she once embraced the Walt is a drug cook lifestyle and wanted to help it keep the family together is slowly realizing that Walt may be in deeper than she thought or imagined. Last week, Walt scared her with his statement of his place in the drug empire and this week she's flabbergasted by how much money Walt makes and the difficulties of laundering $7 million plus a year. Clearly the car wash isn't going to be enough, but how many other legal businesses can they acquire before the IRS comes sniffing around. Speaking of that, one of the early running plots on the show was how despite the sheer volume of cash Jesse and Walt brought it, it was never enough to cover their fumbles and mistakes. We get a hint of that there when Walt has to pay a huge price tag to get rid of the evidence he trashed Walt Jr.'s new car by doing doughnuts in an empty parking lot and then setting the car on fire. Saul asking for the money and giving us the total just reminded me of early days when Walt and Jesse had to make more meth to cover the bills from the last boneheaded move. It also doesn't solve the problem of Walt buying the car and not returning it. Perhaps it was insured, but even that could raise some questions. I can't imagine they've introduced this plot only to have it end here. Perhaps it will finally all register with Hank, who is back on his feet this week and back in the game as it were. The scene with Hank pitching just how Gus could be a drug kingpin was nice, as was his final ace in the hole. Clearly the noose is about to get a bit tighter for Walt and company...and I can't wait.